After 21 years as a wedding photographer and hundreds of weddings under my belt, I can say with 100% assurance that I have photographed weddings in just about any place imaginable in almost any weather condition you can think of. Chances are, while you may have considered the weather as you’re planning your wedding, you aren’t thinking about your ceremony space in respect to lighting. Where the sun may be in the sky at the time you’re getting married is a big deal for your photos – especially if you have a particular look in mind for your images. 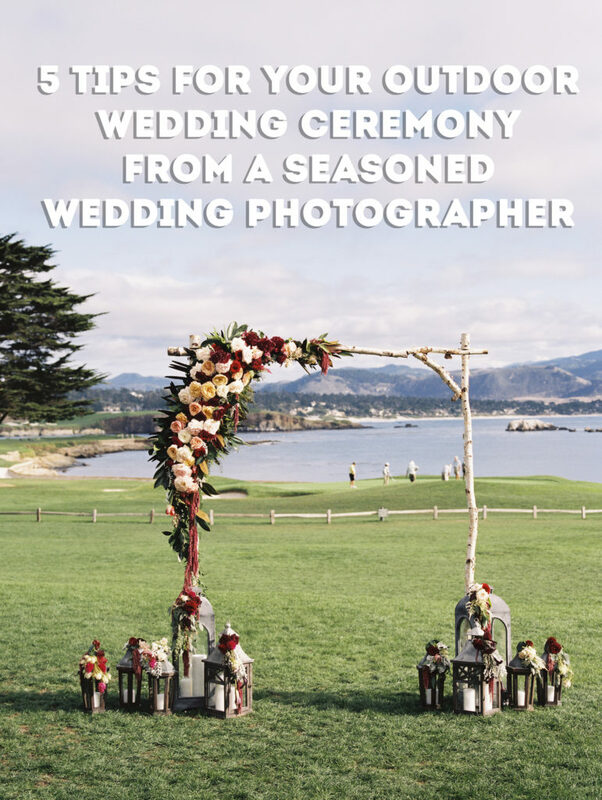 If you’re planning an outdoor wedding ceremony and you want totally awesome photos of the moment you promise forever and ever to your person, then there are some important factors to consider. Being a deep well of wedding and photography knowledge I thought I’d share some of it with you, dear reader, as you plan for your big day. 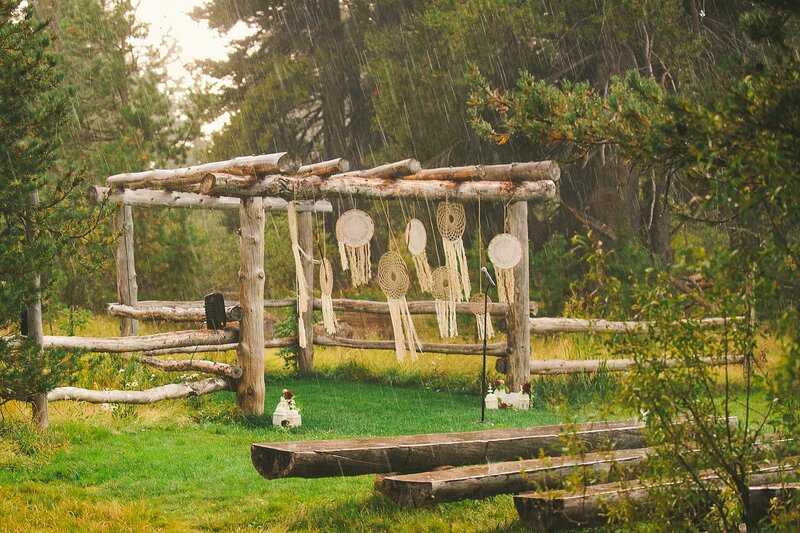 Here are 5 tips for your outdoor wedding ceremony from a seasoned wedding photographer. Often when you’re getting married at a venue, the venue coordinator gives you a ceremony time that most people use. It usually is between 4-6 pm. And while that is all fine and good, it’s usually the time that works best for the venue not for your ceremony light. If you’re getting married in July and dream of a romantic sunset ceremony, then you’re ceremony may happen around 8:15pm. So either your wedding timeline needs to be unique or maybe you should think about a late fall or spring wedding. But chances are, no matter the time of year you’re getting married, you’ll go with the time a venue requires. If this is the case, I highly recommend checking out the ceremony site as closely to your wedding date as possible (perhaps if you’re having a year or so engagement you can check it out the year before) and see what the ceremony site looks like at that time. Take note of which direction the ceremony will be facing. 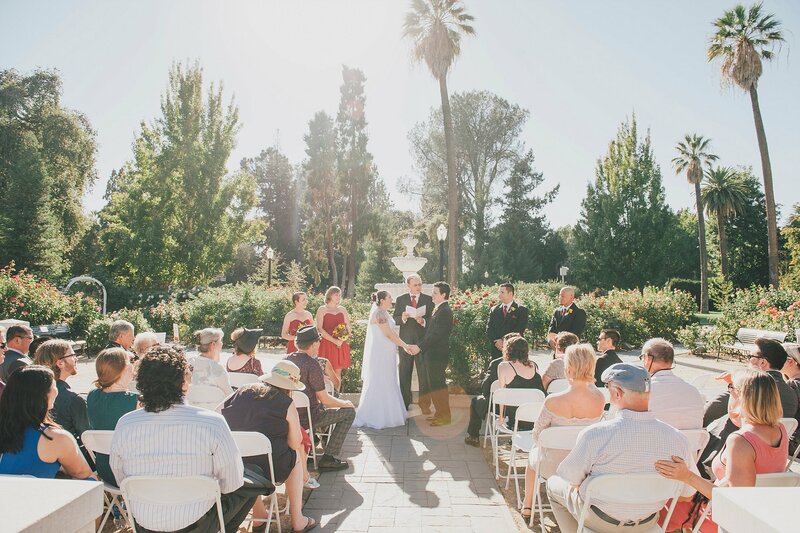 Most venues choose a location where the sun is behind the guests. While it’s nice for your guest, that means that you and your beloved may be standing in the full, glaring sun while you’re saying your I Do’s. This means you may be squinting, one of you may be in harsh shadow while another is fully in sunlight, and both of you may end up very warm and possibly perspiring – a lot. Ideally, when photographing an outdoor ceremony, I prefer the couple to be in full shade or back-lit, which means the couple is standing with the sunlight coming from behind them. This makes for more even photos with more flattering tones. Of course, we will work with ANY situation, but it’s best to know what works best for your big day. If you’re getting married under trees, also think about how the dappled light could effect your skin tones and the final images as well. There is a lot to considering when thinking about light – especially when it comes to your ceremony. This isn’t a time your photographer can ask you to move over a little or something like that! 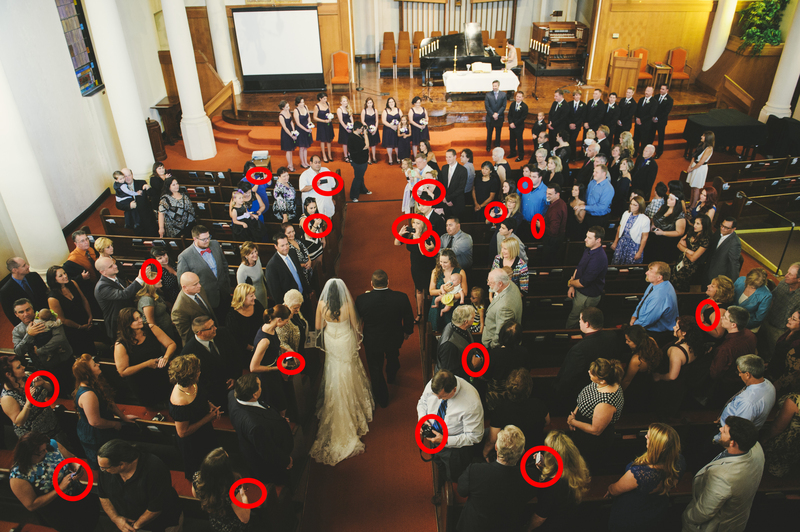 Also, if your photographer has taken photos at a specific venue before, ask them their suggestion for timing. If the ceremony time can’t change, perhaps see if the venue would arrange the chairs facing a different direction for your ceremony. Not only would your photos be better – they will be unique as well! No matter what time of day or of the year you’re getting married, knowing where the light is for your outdoor ceremony is a big deal. Wondering what time the sun sets on your wedding day? Check out SunriseSunset.com to get the details for your area! No matter what time of year you’re getting married having a plan for extreme weather is a smart move. If you’re getting married in the Sacramento area, the summers can be brutal! And sometimes even the autumns! A few years ago, we shot an outdoor wedding ceremony at Capital Park in early October and the temperature was over 98 degrees! The couple wasn’t expecting such a hot day, so their guests were seated in the sun with no covering. Luckily, they had provided some waters to their guest to keep them from getting parched! Hot days are NOT unheard of or unexpected in the summer. Make your guests more comfortable by providing cold water (be careful with providing alcohol before or during the ceremony as that could dehydrate them even more! ), sunscreen and a little shade. If the guests are sitting in the full sun, providing small umbrellas is a great way to keep them cooler and more comfortable while you say I Do. Of course, while California has been in a drought for several years, rain has become a more distinct possibility for a winter, spring or fall wedding. Depending on your location, even the summer could bring some showers. If you’re in the Sierra’s or the Bay Area even the summer months can bring rainy or foggy weather. A couple years ago we photographed a wedding in Kirkwood, California that started off with a lovely day, but as the bride was JUST about to walk down the aisle there was a thunderstorm. The couple stayed SO calm and Kate Whelan Events was also on the scene to move everyone quickly indoors. Kate, always the brilliant wedding planner, was able to get the cocktail hour started early as the guests waited for the rain to pass. When the storm passed, we were left with a brilliant orange sky! The couple were able to take some awesome photos, everyone was dried off and the ceremony took place less than an hour later and was perfect! Sometimes, couples don’t want to call off their outdoor ceremony on account of a drizzle. When rain is in the forecast we always make sure to bring our clear umbrellas, just in case you need them during your ceremony. 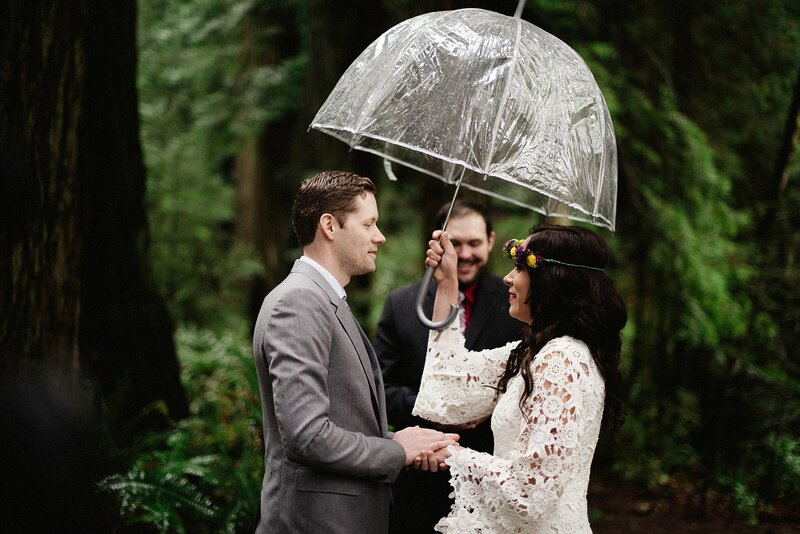 If you’re getting married during a time of year rain could be in the forecast, you might want to think about not just umbrellas for yourselves, but for your guest and wedding party as well. Wherever your ceremony is happening, think about what you’ll be standing in front of. Is the background of your photos going to be beautiful or dull? Will it add to the theme of your wedding or distract viewers both in person and in your photos? These are important questions to ask when you’re planning the decor for your ceremony. Many couples seem to focus on what the aisle flowers will be and not so much about what will be going on directly being them. Having flowers or some other decorative touch on stands on each side of you is great for framing wider shots, but think of those close-up images as well. What will those look like with no flowers or decor in them? Adding some pizzaz to your background can be as simple as a wooden cross if Jesus is your jam, or as intense as draping fabric to an ancient oak tree. Whatever you decide, those details add a special something to your ceremony photos. Work with your florist or wedding designer to get the perfect details to make your ceremony special. Many venues or private locations have amazing views for you to get married in front of as well. Knowing your photographer has the equipment and the know-how to make sure that background can actually be seen in vital to getting the image you have in your head into your hands. Make sure your photographer has off camera flashes to balance the light if needed. 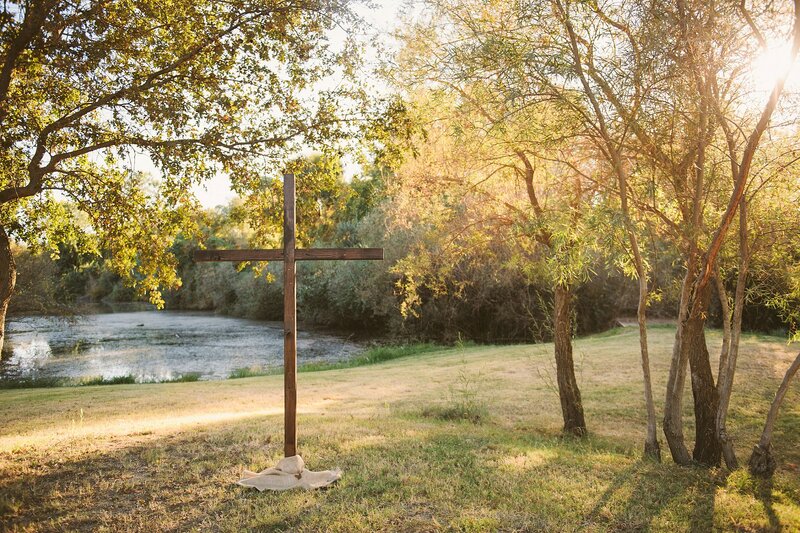 We love photographing the ceremony space at Forest House Lodge in Foresthill, CA for it’s stunning view. But, especially with summer ceremonies, we wouldn’t be able to show any of it and keep the skin tone of the couples right without off camera flashes and using cameras with impressive dynamic range. 4. Reuse your background as reception decor… and more! If you want to repurpose the ceremony flowers to the reception, think about their purpose in both spaces when planning your decor. 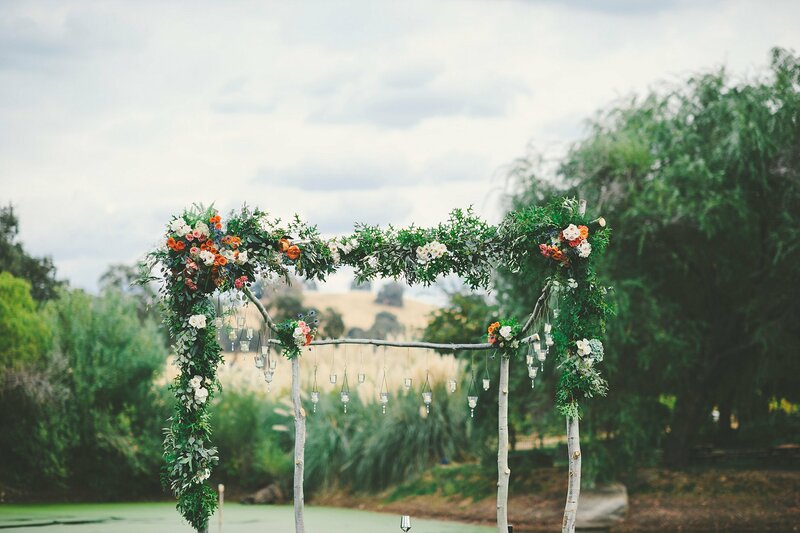 Hanging arch arrangements (like the one above) can be designed in flat containers that can be removed after the ceremony and placed on the head table becoming a low centerpiece. Garlands can be repurposed for the bar or buffet. Make sure there is plenty of time between ceremony and reception for the arrangements to be moved. It works best to have your guest in another ares so the transition is seamless. 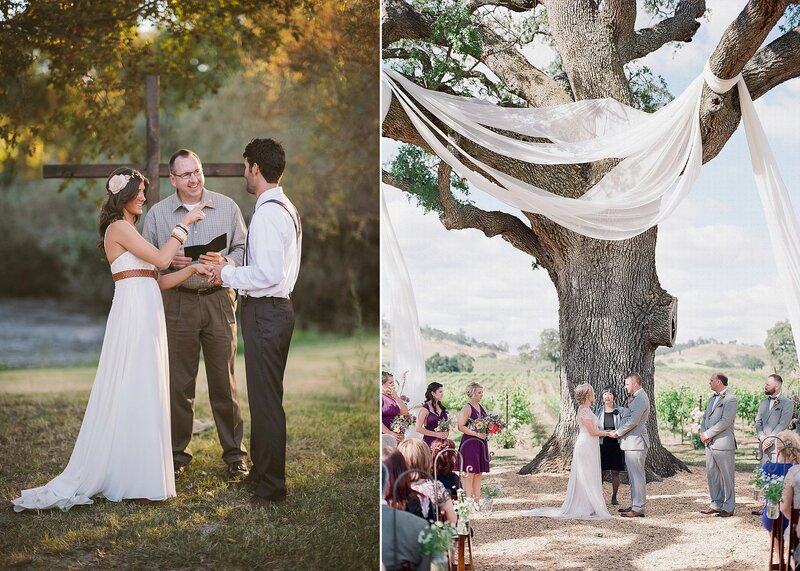 Your ceremony backdrop can also be used for family portraits right after the ceremony, giving it more time in photos. But it doesn’t have to end with the wedding! 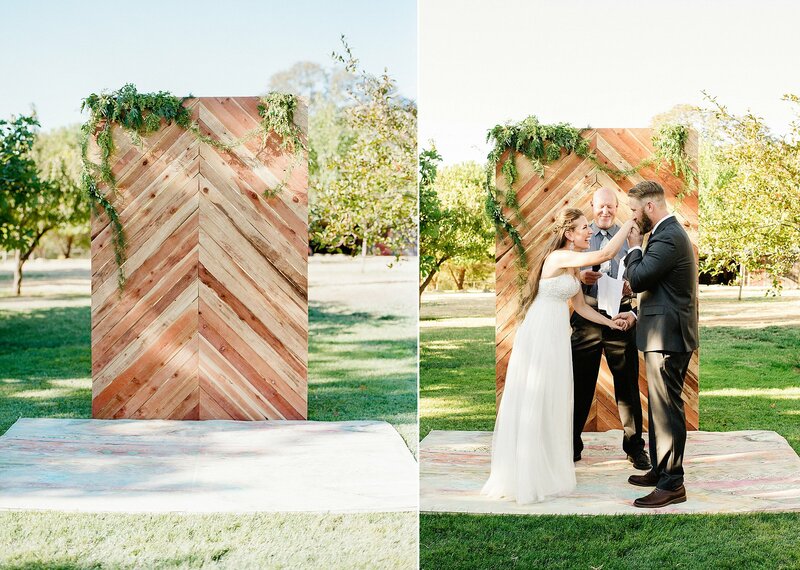 Marie and Jeff make their own wooden ceremony backdrop and then Marie’s dad made it into a dining room table for them! Now their family will eat dinner on the table they were married in front of for years to come – a daily reminder of their vows and love. I LOVE that so much! 5. Unplug your ceremony. PLEASE! You knew it was coming, because if you’ve known me for longer than 30 seconds you know how deeply I feel about unplugged wedding ceremonies. There is a saying in photography, You can’t be at the picnic and photograph the picnic. It is SO true. Photography is actually a distancing thing! It removes you from actually witnessing something. Looking at an event through a lens (or a phone screen) distances you from the event. You can’t be present. And while I think it’s nothing short of MAGIC that we basically carry computers in our pockets now, I am so sad that many guest feel getting a photo of your ceremony is actually more important than the ceremony itself. For me, this is the most sacred part of your wedding day. You are promising your life to your person. You have invited people who are near and dear to you to bear witness of this monumental moment in your life. 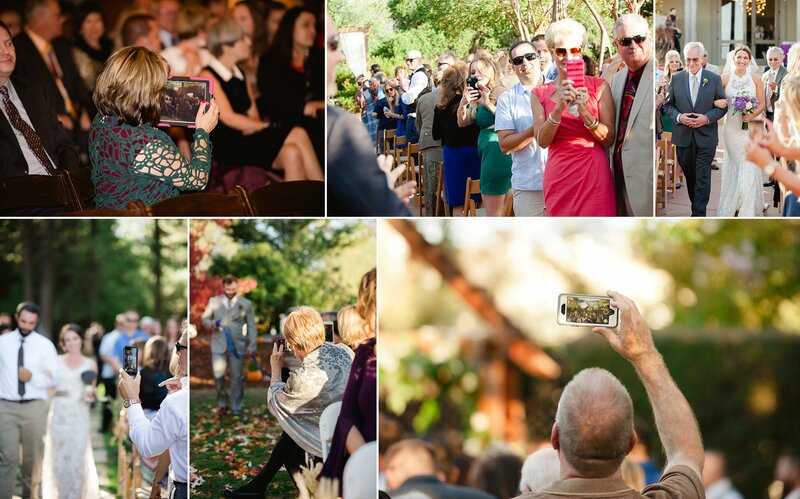 When you look out at your wedding guests do you want to see their faces or do you want to see their phones? Invite your guests to be present for your wedding by powering down their phones, tucking away their cameras and locking up their iPads while you say I do. Let your photographers record this moment for you. Let us photograph you, and your guests watching you say your vows. Invite them to be present! You can find loads of great ideas for signage or verbiage for your program about an unplugged wedding online. Trust me! You’ll be thankful later when you remember faces and not phones. I know this is not an outdoor ceremony, but I remember seeing this picture and gasping. Every red circle is a person watching this once in a lifetime moment through a screen. 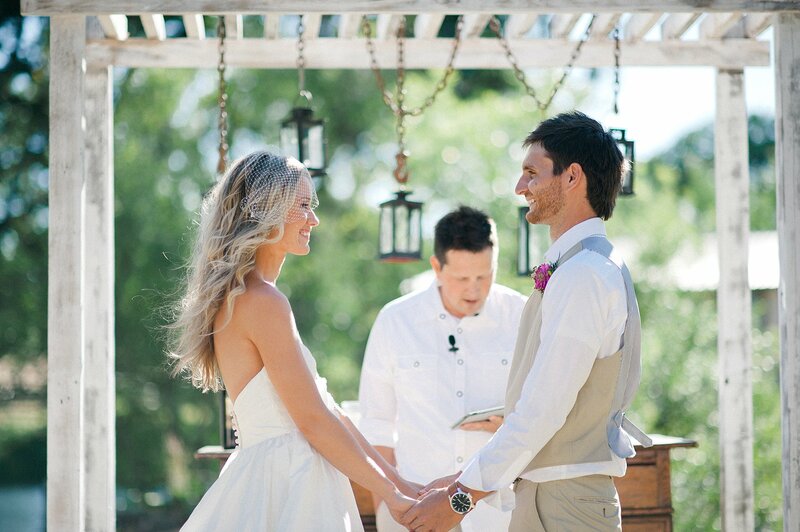 I hope this list helps you plan a picture perfect outdoor wedding ceremony!